Pictures by the lovely Chelsea and Eleanor. Thanks yall for tolerating my experiment. Sugar, salt, pepper to taste. Blend all the ingredients of the curry paste in a food processor to make a smooth paste. Use sugar to balance out the taste. Saute zuccini, squash, and onion with the paste in a pan heated on medium heat. Cook the veggies down until al dente; we don’t want have it too mushy. This should take about 7 minutes or so. At the end, toss in the basil. Let this mixture cool to room temperature by either letting it sit, or cool in freezer/fridge. Then take this mixture and spread about 2 tablespoons on the chicken breasts that have been pounded thin. And simply roll the chicken like a sheet with the filling. I used saran wrap to make the whole process easier and to tighten the rolls. Now all you want to do is pan fry these rolls. 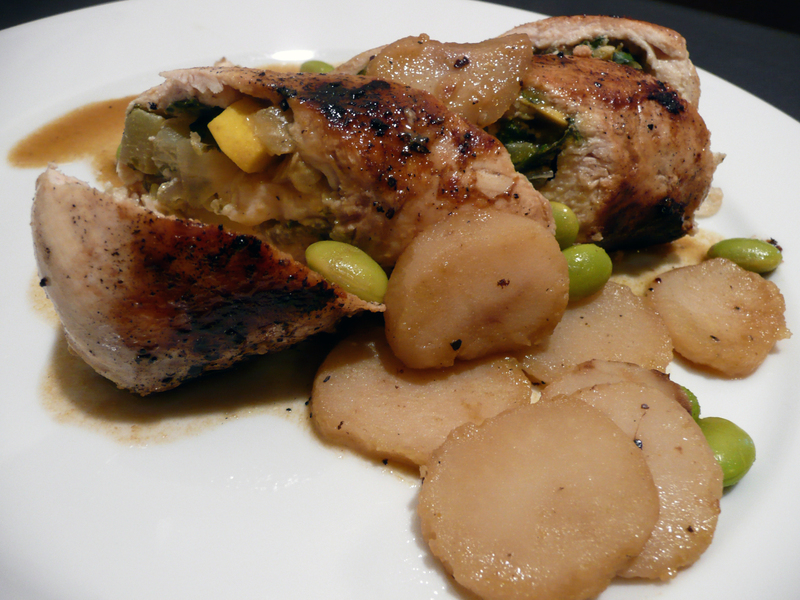 It takes no time at all, because the filling is already cooked, and the chicken is really thin. I was afraid the rolls would be difficult to pan fry, so I pouched the rolls while they were rolled in saran wrap. This was a mistake. It made the chicken dry I believe, having it cooked twice. I’m pretty sure I just didn’t fry it fast enough. Rookie mistake! While the chicken is frying in the pan, you can make the super easy sauce. Basically saute some of the curry paste, edamame, and water chestnut in a sauce pan for about a minute to release those favors. Then add the dashi (ya super weird) and water. Bring to a boil and that’s it! I didn’t want to thicken it, but you could definitely add coconut milk if you want. I didn’t feel like it. I didn’t make enough sauce, so double the recipe. Or triple it, whatever you want. I just wanted more. Just slice up the finished chicken rolls, top with the sauce and there you go. Something really weird definitely, but I think the idea behind it is solid. I just have to do it better next time. Thank god I had really awesome and patient guests over. Clarissa, Eleanor, and Chelsea are super helpful sous chefs! 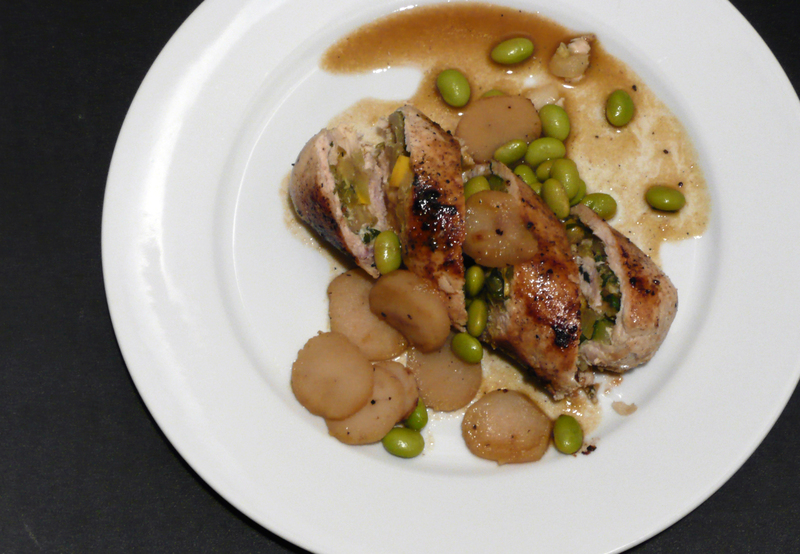 This entry was posted on September 8, 2012 by rrfoods in Chicken, Dinner, Lunch and tagged chicken, Curry, dashi, edamame, lemongrass, paste, roulade, squash, thai, water chestnut, zuccini.